A tender collection of endearments for children the world over. All over the world, people express their love for their children through endearments, such as "sweetie pie" or "peanut." A child might be called little angel, angelito, in Spanish or precious, bao bei, in Chinese or my sweet little moon, mera chanda, in Hindi. This book began when Jacqueline K. Ogburn heard a friend call his children by German endearments. 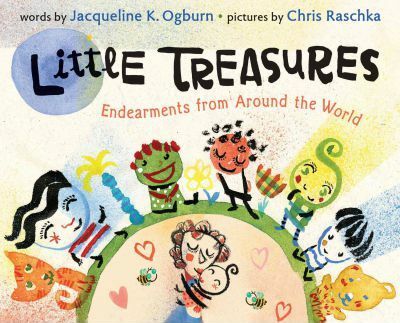 Years later, with the help of many friends, friends of friends, and complete strangers, that fascination has resulted in Little Treasures: Endearments from Around the World. Ms. Ogburn is also the author of nine other picture books, including A Dignity of Dragons and The Bake Shop Ghost. She lives in Durham, N.C. with her husband and their two chicklets, Claire and Emily. Chris Raschka, writer, illustrator and trained violist is one of the country's top children's book talents. His Yo! Yes? was a Caldecott Honor Book in 1993 while his Hello Goodbye Window won the Caldecott Medal in 2005 . This is Chris's first picture book for Houghton Mifflin Books for Children.